In the Kitchen: Happy accident soup (squash & beans). After a couple of days in bed with a migraine I was starving hungry…….but the fridge only had some random left-overs in it…….so this is what I made…..and what a treat it turned out to be. In the Kitchen: Greek Gigantes beans and chard casserole. Mmmmmm……a taste straight from Greece……..a gorgeous combination of the splendidly massive Gigantes beans and chard to fill a gap on a chilly, damp day. In the Kitchen: Kale, rice & nuts pie (or Wellington). A gorgeous, hearty pie for a chilly winter’s day. You will need (all measures approximate – jiggle them to your liking): rice – 2 cups, mushrooms – 2 cups, nuts – 2 cups, stock – 1 litre, onions x 2, peppers x 2, garlic cloves x 2, kale – a big handful (about 200 grams)…….seasonings of choice – I used juice of half a lemon, dill, nutmeg and thyme. Enough pastry for your pie dish. Makes enough for two pies…..one for now and one for the freezer. In the Kitchen: Fennel root soup experiment – free food! I was recently informed that fennel roots are edible so I obviously had to try them out. I’ve never experimented with a recipe on camera before (normally I try experimenting a few times without the camera rolling to get it just right)……..so this is a first……..it’s worth watching to the end. Was it gorgeous or did I spit it out? I was shocked. 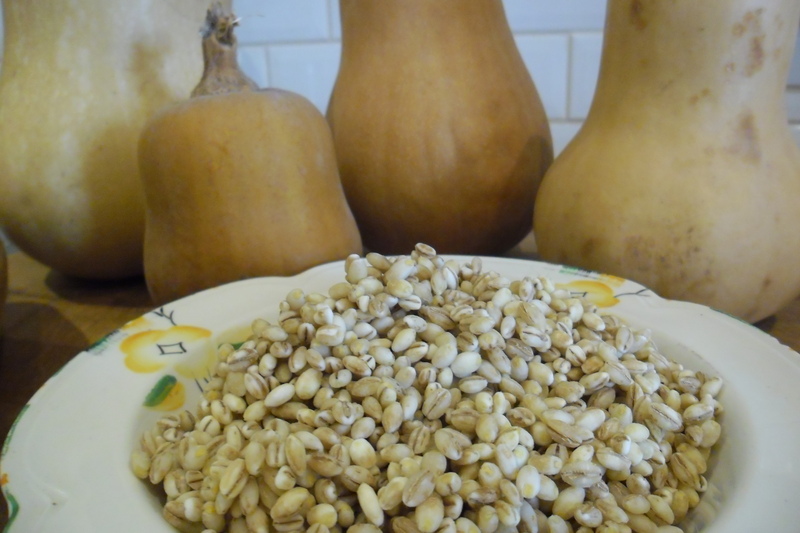 Pumpkin/Squash & Pearl Barley soup.